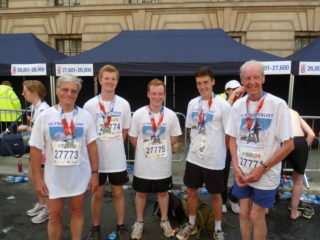 Pictured is the 2013 team who ran the London 10K road race in aid of the Ulysses Trust. Phil Neame, our founder, on the left of the picture had only recently completed the Welsh 3000s event in which he climbed all 14 mountains in Wales that are over 3000 feet within 24 hours. Between them the team raised a magnificent £5000 for the Ulysses Trust. If you have a challenge that interests you or an event organised by others that you want to enter, why not do it and raise money for the Ulysses Trust at the same time? It’s a great way of spreading the word. Our online giving facility with MyDonate means that you can now create your own online fundraising page simply and quickly. Just click on the Start Your Fundraising Event button below, follow the instructions, and go for gold! To further assist you, let us know what you are doing and we may be able to help you to promote your endeavours further. Please email us to discuss your plans.